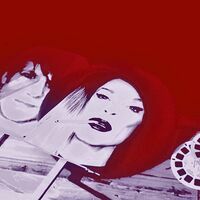 Originally from Oakland CA, Las Vegas' Fans of Jimmy Century is an original indiewave, modwave, neo noir duo with trip hop influences and led by vocalist/songwriter/voice over artist Alicia Perrone and bassist/songwriter/producer Victor James. Newest single, the aggressive "Best of My Generation (Johnny Rotten)" came out April 27, 2018 charting on iTunes Rock charts Top 25 in Germany and Top 40 UK in its opening week. A music video, aka Buddha and Johnny make an action film, will be released May 31, 2018. FOJC is inspired by both genre bending and creating alter egos to match their songs' vibes and videos, having released an eclectic range of singles in 2018 & 2017 - the downtempo trip hoppy "Noirstar (Memories of His City)" March 2018, the villainous Tim Burton-esque “All My Friends Are Ice Queens” Dec 2017 and the electro anthem "Ghosts of Paradise" Oct 2017. They remained independent until 2014 when they signed a 2-single deal with Bungalo/Universal Music Group. Their debut song for the label “Va Va Voom to the Moon,” received consistent airplay on Vegas’ commercial station Mix 94.1. They left the deal and continued to self-release in 2015. Soon after, their song, “Delicate Fever,” was featured in the WB movie “Get Hard" with Kevin Hart & Will Ferrell. Sync placements include Gossip Girl, Forever 21, Finding Nemo 3D, E News Live, Hall Pass, Bad Teacher, Ray Donovan, Law and Order: SVU, Betsey Johnson XO, Melrose Place, Housewives of NYC and more. Their best performing sync song is still debut single “Hot Sahara” which was a Gossip Girl and L Word hit at the launch of the band and continues successful film/tv placements today. FOJC also produces a popular residency show at The Copa Room on the Las Vegas strip southside called Fatale Originale.